​Joy in Haiti - Helping Haitian Women Help Themselves! We need your help in raising $11000.00 to build the new Sewing Cafe structure. The Sewing Cafe offers the opportunity for young women in the community to learn to sew and help support their families. This is much more than a job for these young women, it represents a chance at a better life by teaching them a lifelong skill. 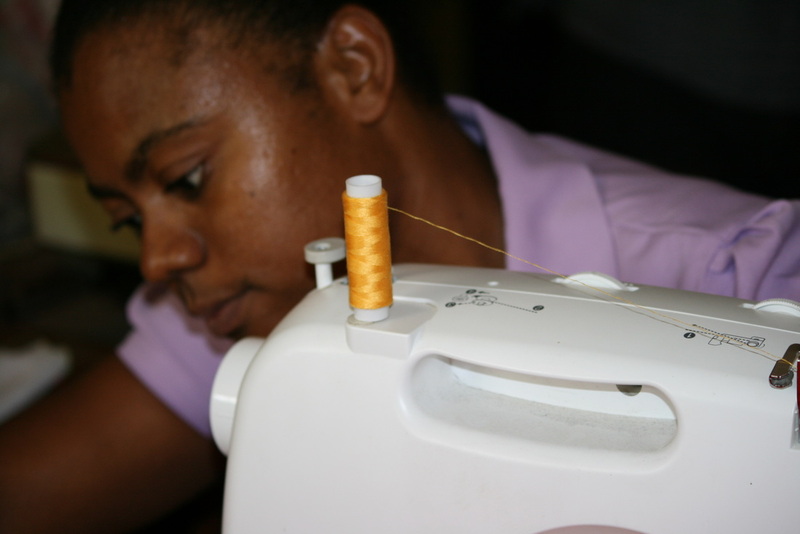 In addition to learning how to sew, they also get a glimpse of how a small business works. The skills and business insight they gain helps them to see a brighter future. 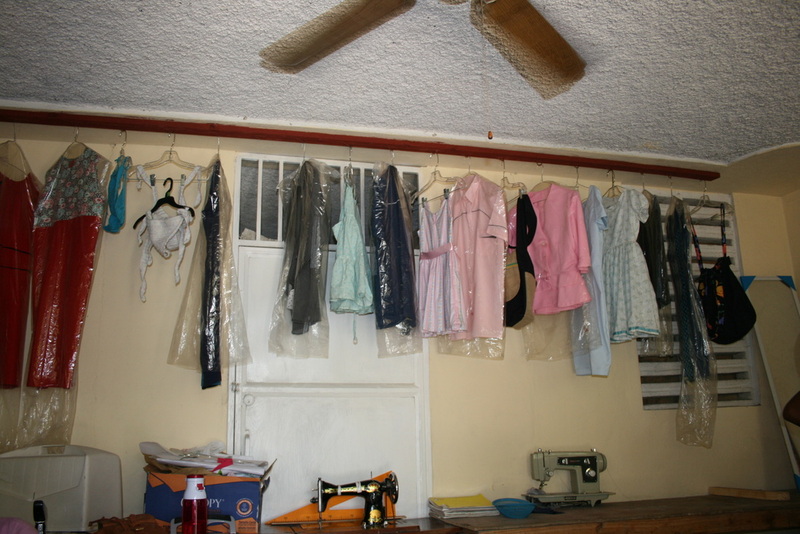 The Sewing Cafe generates their income through contracts for school uniforms, weddings, choir robes, etc. For the last few years the Sewing Cafe has operated out of a small rented building, it was small but it served its purpose. Rent is due in February for the coming year but we have an opportunity to move the sewing machines into an empty school room at The Christian School of Tabarre. This room will be a temporary arrangement while a separate building can be built on the same property. This new building will become a permanent, rent free solution! $11,000 to build a secure room that will have a cement roof, a raised concrete foundation, windows, sturdy door, and tiled floor. With your help, we can make this dream happen! Sewing ladies hard at work--cannot wait to share more with you soon. THANK YOU FOR YOUR PATIENCE. The Sewing Cafe was a created through a vision of Pastor Brisenault's, as a way to assist in relieving some of the poverty within the community. It would not only provide employment opportunities, but also be utilized as an educational outreach to learn the skill of sewing. 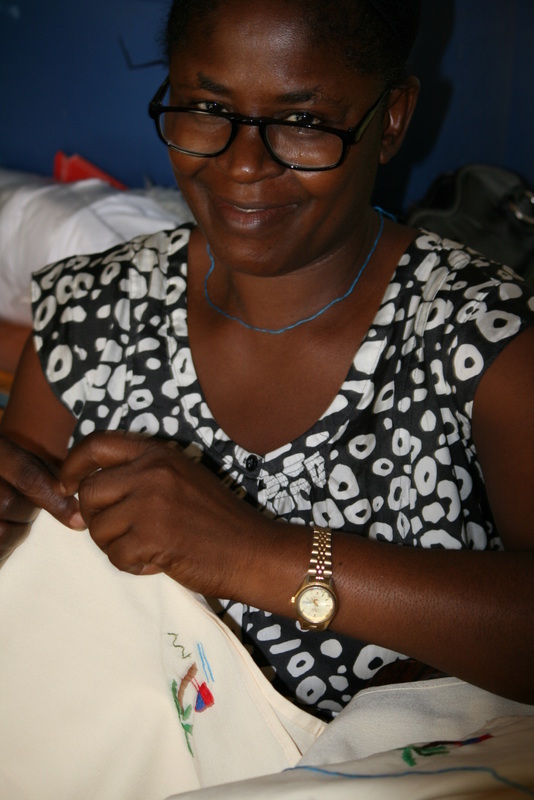 A sewing teacher is employed who gives lessons to young men and women in the local community, who in turn will work for the Sewing Cafe for a time, to earn their tuition if they cannot monetarily afford it. 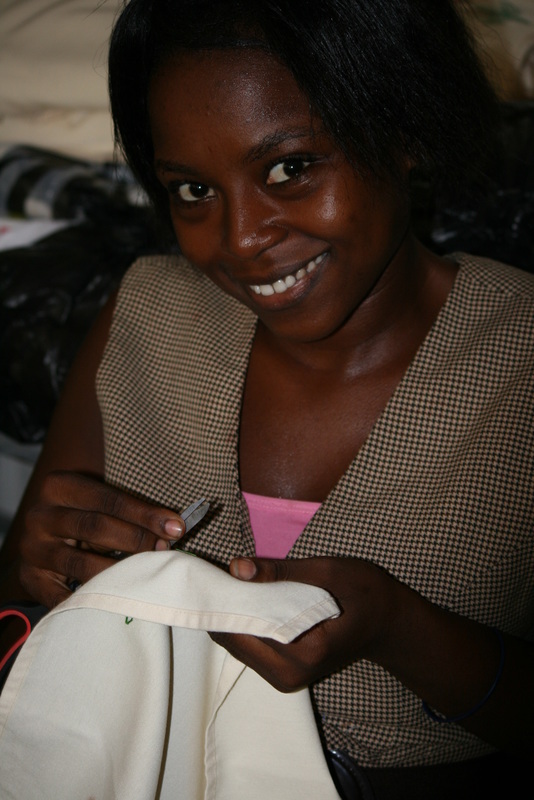 The skills acquired will enable them to obtain jobs, sew on their own for others for income or simply for their own family, providing much needed new clothing. The ladies at the Cafe were contracted last summer to hand embroider 100 napkins (donated from a friend of the organization!). The napkin sets were then sold stateside and provided a bit of income for each seamstress on the project, and also raised funding for the yearly Cafe rent payment. 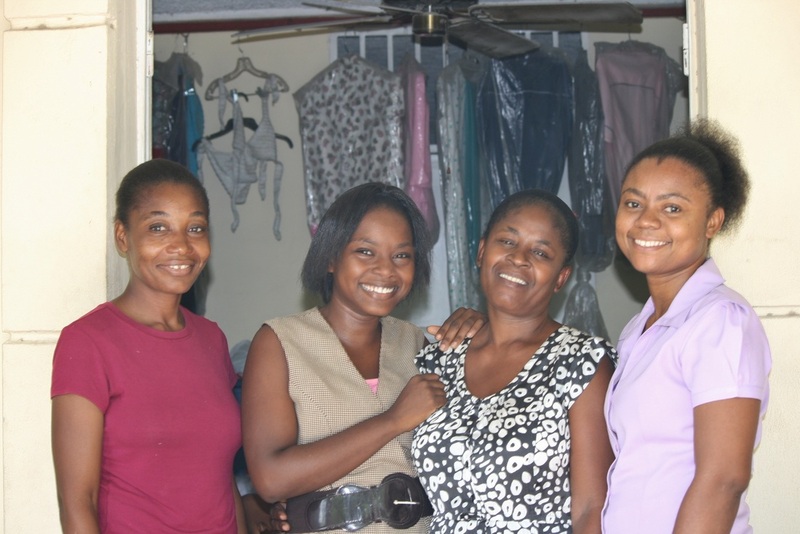 While in country in September 2015 on her first mission to Haiti, (see picture, to right), first time visitor Angela Nolin, hired the Cafe Seamstress to sew a couple of work skirts for her! They were reasonably priced, perfectly fit and finished within the few days that she was in country!